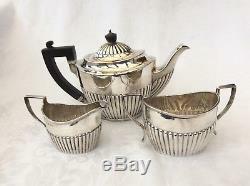 A lovely Victorian solid silver Bachelor Tea Set. 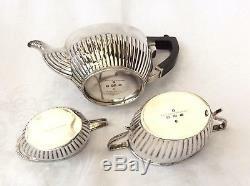 Comprises Teapot, Sugar Bowl and Milk Jug. The Teapot measures 8 1/2 or 21.5cm from handle to spout. It stands 5 1/4 or 13cm tall. Combined weight is 540 grams or approx. In the Queen Anne style - of oval shape with half fluted decoration. 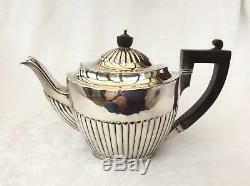 Teapot with ebony handle and finial. 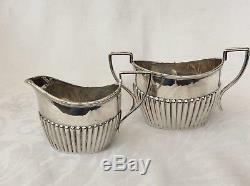 The twin handled Sugar bowl and the Milk Jugs have geometric silver handles. 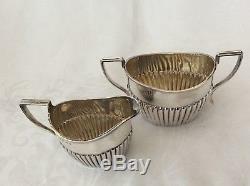 Hallmarked for Birmingham 1888 and 1890. Maker's mark of prestigeous silversmiths Elkington and Co. 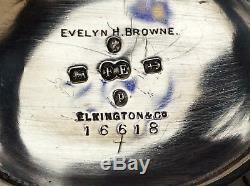 There is a very discrete name'Evelyn H Brown' engraved to base of each piece. 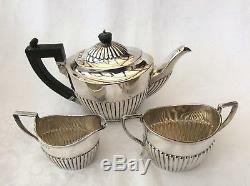 In very good condition - no bumps or bruises other than minor light surface bruising to a small area of the Tea Pot. 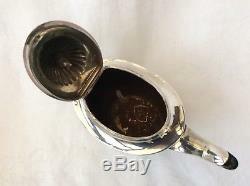 The Teapot handle is firm and the pins are in place - the hinge is good and the Lid closes precisely. Smart and clean inside and out. 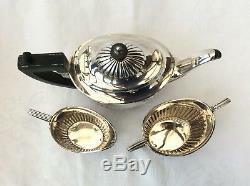 The item "VICTORIAN SOLID SILVER BACHELOR TEA SET Elkington & Co, 1890" is in sale since Sunday, November 18, 2018.